For other uses, see Inferno (comics). "Inferno" was a Marvel Comics company-wide crossover storyline in 1989 that mainly involved the mutant titles, namely Uncanny X-Men, X-Factor, X-Terminators, Excalibur, and The New Mutants. The story concerned the corruption of Madelyne Pryor into the Goblin Queen, the final transformation of Illyana Rasputin into the Darkchylde, the demonic transformation of Hobgoblin, and a demonic invasion of New York City. The series was written by Louise Simonson, Chris Claremont, Steve Engelhart, Gerry Conway, David Michelinie, Ann Nocenti, Walter Simonson, Jon Bogdanove, Terry Austin, and Julianna Jones. Cover to The Uncanny X-Men # 240 (Jan 1989), the storyline's first issue, by Marc Silvestri. Two demons from Limbo, S'ym and N'astirh, plan a demonic invasion of Earth. Their plan revolves around Illyana Rasputin of the New Mutants, as her mutant power allows her to open passages between Limbo and Earth. During one of the New Mutants' routine stopovers in Limbo, N'astirh casts a spell blocking Illyana's teleportation power, thus trapping the New Mutants in Limbo with S'ym, who has taken control of Limbo's hordes and is eager to kill the New Mutants in order to solidify his claim to Limbo. Illyana assumes that the entrapment spell was cast by S'ym, and so sees no reason to distrust N'astirh when he advises her that she can return to Earth by embracing her demonic power. She does so and opens a gateway to Manhattan. N'astirh had kidnapped Wiz Kid of the X-Terminators and coerced him into building a spell-casting computer; once Illyana opened the gateway, he uses this computer to cast a spell holding it open. The city of Manhattan falls under siege, and the Avengers, Fantastic Four, Daredevil, Power Pack, and Spider-Man fend off numerous demons, as well as Hobgoblin, now possessed by a demon, and the mutant-hating Bogeyman, transformed into a monster by N'astirh. Inanimate objects become demonically possessed and begin attacking and devouring people. As shown in Daredevil and X-Men, most residents of Manhattan treat the demonic invasion as a part of normal life in the city. Buses still run, under an all-volunteer force since the drivers had either been eaten or transformed into demons themselves. Subways function, and people ride them willingly, even though some only go into Hell. Stores still sell products. Helicopter tours run. Meanwhile, N'astirh had made a bargain with Madelyne Pryor, agreeing to locate her son Nathan and manipulate the X-Men into killing the Marauders in exchange for her casting a spell that would make a permanent bridge between Earth and Limbo. To keep his end, N'astirh alters the X-Men's computer systems so that they can use them to locate the Marauders. Driven to bloodthirstiness by N'astirh's Inferno spell, the X-Men attack the Marauders' headquarters, gleefully killing most of them in the ensuing battle. Colossus remains unaffected by this spell, due to the protection of his organic steel armor. However, when he learns what happened to his sister Illyana, he concludes that he can only free his fellow X-Men from Inferno's influence by saving her. In fulfillment of his other half of the bargain, N'astirh liberates Nathan from Mister Sinister's laboratory, where Madelyne learns that she is in fact a clone of Jean Grey created by Sinister. With their plan fulfilled, N'astirh and S'ym begin fighting each other for leadership of Limbo's hordes (and by extension, rule of both Limbo and Earth). With S'ym gaining the upper hand, N'astirh makes a desperate bid for victory by letting himself be infected with the Transmode Virus. He then merges with Wiz Kid's spell-casting computer, increasing his magical powers exponentially and thus allowing him to make a permanent bridge between Limbo and Earth without Madelyne Pryor's help. However, Wiz Kid destroys the computer before N'astirh can make use of this power. The explosion reduces N'astirh to ashes, but he is immediately reconstituted by the Transmode Virus. Finding Illyana, Colossus is horrified to see that she has so completely given in to her demonic side that she is totally covered by her eldritch armor and has demonic horns, legs, and a tail. Ashamed at her brother's reaction, she flees into Limbo, and decides to end the demonic invasion by assuming rule of Limbo. However, her teammate Rahne Sinclair persuades her against this, and she instead gives up her demonic powers by creating a massive stepping disc that banishes most of the demons back to Limbo, including S'ym, then throwing her Soulsword in after them to seal the portal shut. Afterwards the New Mutants find a seven-year-old Illyana inside the husk of her eldritch armor. However, while Illyana's actions banished all demons native to Limbo except for N'astirh, people and objects who had been demonically possessed remain uncured. N'astirh is destroyed by the combined efforts of the X-Men and X-Factor, but Madelyne Pryor maintains the Inferno spell and threatens to kill her son Nathan as a demonic sacrifice to open the gate between Earth and Limbo. She forcibly links herself to Jean Grey's mind and shows her her entire life, including what she learned in Mister Sinister's laboratory. Meanwhile, the X-Men and X-Factor break through her defenses and rescue Nathan. In a fatal bid for revenge, Madelyne wills herself to die, attempting to take Jean with her. However, as Madelyne dies, the fragment of the Phoenix Force that first gave her life emerges and bids Jean to use its power to save herself. Jean does so, thus breaking Madelyne's mental hold on her. New York returns to normal. However, due to their mind link, part of Madelyne's personality was transferred to Jean, and she becomes determined to get revenge on Mister Sinister, now seeing him as responsible for all her sufferings. The X-Men and X-Factor learn that he took over Professor Xavier's School while its headmaster, Magneto, was occupied with the demonic invasion. Aware of their coming, Mister Sinister waits until they are inside the school and then sets off explosives which demolish the building. However, none of the X-Men or X-Factor are killed or injured by the explosion, and some are not even rendered unconscious. Cyclops blasts Sinister to a smolder. Despite all of the destruction and death, many human Inferno survivors are convinced it was all a shared hallucination. When collected into a trade paperback, only the portions from The Uncanny X-Men, X-Factor, and The New Mutants were included, and the latter story line was presented separately from the first two. To avoid losing track of individual characters and plot threads in the story's large cast, editor Bob Harras maintained roughly 20 pages of timelines for how each character would develop over the course of "Inferno". The 2008 miniseries, written by C. B. Cebulski, X-Infernus, and starring Magik, serves as a sequel to "Inferno". A second sequel, "Fall of the New Mutants", centers around Project Purgatory, a government operation that took the mutant babies used to make the portal to Limbo, who were recovered alive and well, to make an Army controlled base in Limbo, as well as trying to figure out how to activate the powers of the mutant babies. Four years later (though due to a time dilation effect between Earth and Limbo, 26 years passed for them), Project Purgatory's surviving soldiers, led by General Ulysses, along with the new fully grown and powered surviving Inferno babies, both groups of which are battle scarred, and some of each having what appear to be grafted on demon body parts, have returned to Earth, apparently out to capture Illyana Rasputin. Face: Weaponized brain stem. Capable of emitting a highly destructive energy blast from face. Due to the nature of his mutation, he is deaf, blind and mute. Bionic cranio-facial plate allows him to control his blasts. Shauna: Induces paralysis and drowsiness through contact with her leech-like hands; can also "taste" those she holds between her hands. Toko: Generates impenetrable and immovable forcefield. Alex: Gelatinous form, capable of engulfing opponents and inhibiting their mutant powers. The composition of his body means he is resistant to injury. Bob: Blue skinned, can create miniature duplicates from his blood cells. As part of the 2015 "Secret Wars" storyline, there was a mini-series called "Inferno." Its domain in Battleworld is known as Limbo. Five years ago in a variation of Manhattan, a bunch of demons rose up from the depths of Limbo and ravaged it. Since then, Limbo has been separated into two different areas: the area that is policed by the X-Men and the area around the Empire State Building that is surrounded by demons with a captured Illyana Rasputina inside as well. Illyana's brother Colossus is determined to rescue her at all cost. Colossus eventually agrees to work for Cyclops for 364 days a year. But on the anniversary of Magik's capture, Peter gets to lead a team of volunteers to try a rescue attempt. In their fourth attempt, Cyclops gets clawed in the back in a way that angers Jean Grey and causes her to effectively end the fight in a draw. In an effort to make Cyclops' and Jean Grey's sacrifice meaningful, Colossus manages to make it to his sister. It starts off as an emotional reunion, but Colossus finds out the hard way that his sister is already lost. She reveals that she became Darkchylde, ruler of Inferno after she was able to overthrow Baroness Madelyne Pryor. She even corrupts one of his arms to reinforce her point. In the fifth anniversary/fifth rescue attempt, Colossus leads a team including Domino, Boom-Boom, and Nightcrawler into battle against the numerous demons. Despite Cyclops' clear and understandable warnings, Colossus leads the team right into the demon hordes, but eventually his lack of strategy catches up with him. Nightcrawler gets himself captured by Darkchylde and Boom-Boom apparently gets killed by N'astirh. Colossus is prevailing against the demons for a while, but even he gets roughed up by the Goblin Queen and her minions Goblin Prince and S'ym who had subdued Domino. As Madelyne Pryor holds Colossus over an army of demons, she gives a speech to the demons saying that Colossus thinks he can stop his sister. She then questions whether he's tough enough to do so and hints that if he is tough enough, then they would gladly follow him in this battle. Madelyne throws him into a horde of demons to test his toughness. A quick, but brutal battle unfolds with Colossus failing miserably and his arm that Darkchylde corrupted turns against him. Madelyne makes an unexpected contribution and surprisingly throws the Soul Sword down into the arena for Colossus to wield with his demon arm. With it, Colossus has a new power at his disposal and his demon arm allows him to wield it. Meanwhile, as Domino (who was placed in a fiery prison cell) works her charm on a familiar looking kid to exploit an opportunity to escape, Darkchylde uses her powers to corrupt Nightcrawler and turn him into a massive and immensely powerful demon, that only she can control. After showing his skills with the Soul Sword, the Goblin Queen invites him up to her throne room and explains that not just anyone can wield the Soul Sword and his ability to do so with his demonic arm actually gives them a fighting chance against his sister. She then says outright that she wants to help him get Illyana Rasputin off the throne. She'll even lend him her demon hordes to give him a better chance than just a handful of X-Men. With Colossus leading the charge, they make it to Magik's central lair in Limbo. The thing is she's not there. Colossus is understandably confused while Madelyne Pryor is pleasantly surprised. She didn't want to save Darkchylde. She just wanted the throne and she just happened to arrive to find it vacant. There's some tense moments with Colossus and Domino, but they quickly find out that Darkchylde has a very good reason for not being there. Armed with a demon-infused Nightcrawler, the laws of Limbo can't be apply to her anymore so she just teleports her army right to the front door of the X-Men's headquarters, catching the mutants completely off-guard. What makes this attack all the more devious is that it took Colossus, Domino, and Madelyne Pryor out of the equation. By invading Limbo with their forces, they've essentially trapped themselves there. Now they can't aid the X-Men in any capacity. Madelyne is remarkably okay with it. She wanted Darkchylde's throne. Well, now she has it. While outside Limbo the battle unfolds pretty furious as Darkchylde tries to break the force field that's keeping the rest of Limbo from spreading around the domain. The mutant heroes can't be kind anymore so Cyclops rallies the X-Men to him and urges them to fight the demon army. However, by doing this some ended up abandoning their posts, leaving parts of their base vulnerable. They thought Darkchylde couldn't get there because of the shielding, but with Nightcrawler converted into a demon, Darkchylde was easily able to bypass all barriers. Armed with Nightcrawler's teleportation powers, Darkchylde teleports inside the building and confronts Beast and Dr. Strange while back at Limbo, Madelyne Pryor drops by Colossus and Domino to inform them that the situation with the X-Men has entered a new level. The force field that held Darkchylde's demonic forces back is down, thanks to her sneak attack against Beast and Dr. Strange. Now the full force of her army can invade and crush the X-Men. Cyclops, still tries to return to the base and stop her. Even without his legs, he's still determined to fight. Darkchylde makes clear that she's won and his neck is ripe for snapping. As the attack continues to unfold, its revealed that there are actually other forces involved, in the form of Mr. Sinister who hints that he's been pulling a few strings through this demon-powered storm. Darkchylde watches gleefully as her demons ravage the other boroughs of New York, while she in turn is being watched by Longshot. He witnesses how Sheriff Strange appears and offers her the role as baroness of the domain, since Scott Summer failed to keep order. In the meantime, the surviving X-Men are hiding in the sewers. Jean Grey suggests they leave the domain but Cyclops refuses. Longshot joins them and tells them the grim news. Moments later, they are attacked by Darkchylde's troops. Elsewhere, Colossus and the Goblin Queen's army are slowly making headway, though they are losing goblins. They are surprisingly found by Boom Boom, who wants to lead them to her savior, hiding in the tunnels. While Boom Boom and Madelyne argue about her intentions, Colossus hears fighting on the other side and smashes through a wall to find the X-Men battling demons. They join the fight, and Madelyne even managed to save Jean Grey from the dragon Nightcrawler by telepathically destroying his mind, making sure he obeys her now, but, when Colossus apologizes to Cyclops for not trusting him, Cyclops gets furious. They are interrupted by Boom Boom's savior, Mr. Sinister, who is accompanied by several Boom Boom clone demons, and tells them they need each other. In the sewers, Mr. Sinister suggests an alliance to the X-Men. However, Madelyne, out for revenge, manages to kill him by mind controlling the real Boom Boom. In the meantime, N’astirh has informed Darkchylde of the X-Men, Pryor and Sinister meeting in the sewers. 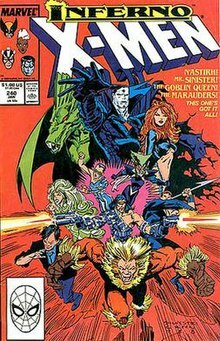 Back in the sewers the X-Men soon realize that killing Sinister was a mistake as the Boom Boom clone demons screech and manifest time bombs ready to kill Madelyne, who is herself ready to die, however Havok throws himself in front of her as the timebomb goes off. Madelyne then used the dragon Nightcrawler to kill all the clones. Darkchylde soon arrives and massacres most of the heroes and goblins. Of the X-Men, only Colossus, Boom Boom and Domino survive. Colossus tries to kill Darkchylde with the Soulsword but she turns into Illyana and begs him not to hurt her. He hesitates and, a moment later, she is Darkchylde again. She claws his chest open as she laughs that he is too easy. He again tries to strike her with the sword but she turns human again, crying he can't mean to murder his own flesh and blood! Once again he hesitates. Seeing how Darkchylde is messing with Colossus' head, Domino decide to join the fight, but she too is quickly overwhelmed by the baroness. Watching his lover being threatened gives Colossus the strength to realize his sister is gone and he splits her apart with the sword. The three X-Men decide to leave the domain. Madelyne and her son have survived as well and she inherits the Darkchylde's power, coming out as the winner. In the reality of Earth-89112, towards the end of Inferno, Illyana's Soulsword returns to Limbo at the same time as S’ym. The demon uses the sword to return to Earth and, together with the Goblin Queen, kills the X-Men except for Wolverine who becomes demonized. The demon infestation spreads all over the planet. While the few remaining heroes attempt to devise a plan, the demon hordes attack, killing most of the heroes. Only Dr. Strange and a handful of others escape. Strange eventually discovers Rachel Summers, frozen as a mannequin. He frees her and they rejoin the remaining heroes. Before Strange can summon the Phoenix Force to cleanse the world, the hordes attack again, this time with the aid of Baron Mordo. Many more die until Wolverine returns to the heroes’ side and Baron Mordo betrays his new demonic allies. After the deaths of both S’ym and the Goblin Queen, Rachel summons the Phoenix Force and uses it to purge the demonic infestation from the Earth. The world is reduced to a primitive state and given a new beginning. Part of the story has been collected into a trade paperback, X-Men: Inferno (ISBN 0-7851-0222-1). A hardcover collection (ISBN 978-0-7851-3777-1) was announced in December 2008, for publication on May 28, 2009, which would collect X-Factor #33–40, X-Terminators #1–4, X-Men #239–243, New Mutants #71–73 and the backup story from X-Factor Annual #4. The remaining issues appeared in hardcover as X-Men: Inferno Crossovers (ISBN 978-07851-4671-1) which collects Power Pack (vol. 1) #40 and #42–44, Avengers (vol. 1) #298–300, Fantastic Four (vol. 1) #322–324, Amazing Spider-Man (vol. 1) #311–313, Spectacular Spider-Man (vol. 1) #146–148, Web of Spider-Man #47–48, Daredevil (vol. 1) #262–263 and #265, Excalibur (vol. 1) #6–7, and Cloak & Dagger (vol. 3) #4. ^ Zimmerman, Dwight Jon (November 1988). "Bob Harras". Comics Interview (62). Fictioneer Books. p. 12. ^ "SECRET WARS Gets Hot With INFERNO Redux". newsarama.com. Retrieved 17 April 2018. ^ "Marvel Comics Solicitations, February 2009". comicbookresources.com. 18 November 2008. Retrieved 17 April 2018.